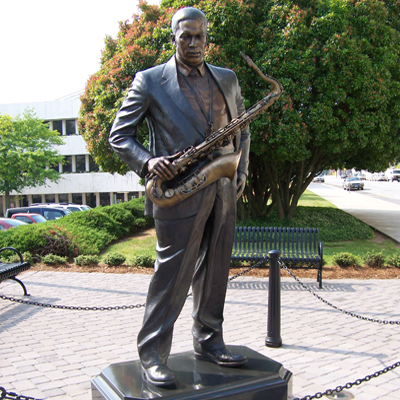 The eight foot tall bronze statue depicts jazz musician John Coltrane, one of High Point’s most distinguished citizens. He is holding his saxophone with his head tilted slightly down and to the right. The sculptor strove in this work to embody the strong, contemplative man whose music was said to move people to tears. The statue stands on a low black marble base with JOHN COLTRANE incised with white lettering. The September 20, 2006 unveiling date was in honor of Coltrane’s 80th birthday, three days prior. The ceremony included reading from an emailed note sent by musician Carlos Santana on how much Coltrane had influenced his own music. The unveiling was also featured with spots on CNN and “Good Morning America.’’ “I think we have just begun,” said committee member and music lover Joanna Easter. “This is, in my mind, is just the beginning of what we can do in the name of John Coltrane.” The news reports noted those in attendance included one of Coltrane’s cousins representing the family and one of the world’s biggest collectors of Coltrane memorabilia who flew in from Japan. A blind UNC-Chapel Hill student, who was writing his dissertation on Coltrane, also came to hear the presentation and touch the bronze saxophone. Coltrane performed and recorded with Dizzy Gillespie, Johnny Hodges, Miles Davis, Thelonious Monk and other jazz legends and is considered the greatest jazz saxophonist to ever live. In 1965, he was named Down Beat magazine’s “Jazzman of the Year.” He died of liver cancer at age 40 on July 17, 1967 at the prime of his musical career. The John Coltrane International Jazz and Blues Festival, held annually in High Point, was as an outgrowth of the efforts to erect the statue to Coltrane. The statue is located on the northeast corner of High Point City Hall property at Commerce Avenue and South Hamilton Street. The statue stands between the side walk and a parking lot, surrounded by trees, with benches on both sides.